I have such a delicious recipe to share with you guys today, but first . . . This is the second cookbook I have of Francine Bryson's. Her first book, Blue Ribbon Baking from a Redneck Kitchen, is full of so many amazing sweet recipes. This new book includes more than just sweets . . . the majority of the recipes are savory recipes from appetizers and dips, to sides and main dishes. 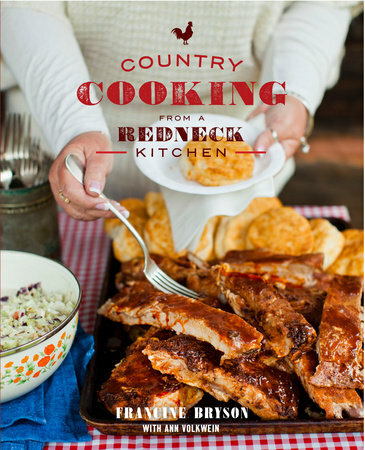 You've probably had a version of many of the recipes in this book (Pork Chops, Meatloaf, Fried Chicken, BBQ Pork). There isn't anything too crazy, except for the Squirrel Pot Pie (Yes, I'm serious) . . . apparently, you can purchase squirrels at grocery stores in the South and in case you are wondering, she says it tastes like chicken! The pictures that are in the book are gorgeous, the ingredients are pretty common, the instructions are easy to follow and I loved reading the story behind each of these tried-and-true recipes. Some of the other recipes I can't wait to try are: Beef Crunch Bake, Garden Dip, Easy Yeast Rolls, Buttermilk Pecan Skillet Cake, Holiday Whoopies, Lemonade Rolls and Peppermint Cake. Overall, I like this book. I have tried a few recipes and loved each one. I do have more of the sweets and bread recipes flagged to make than the savory ones, but that isn't anything new for me. That's how it is with most cookbooks. AND . 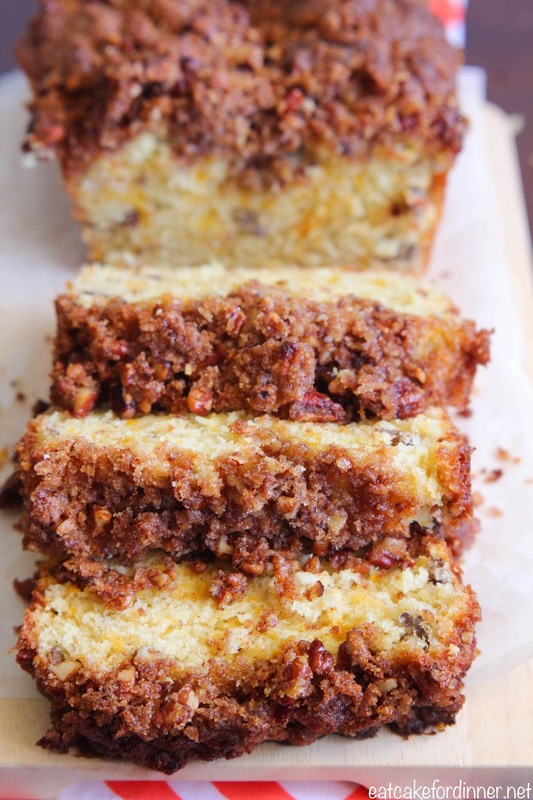 . . even though I have tried a version of many of the savory recipes, I still want to try her recipes, because I'm sure they have been perfected and are fabulous. 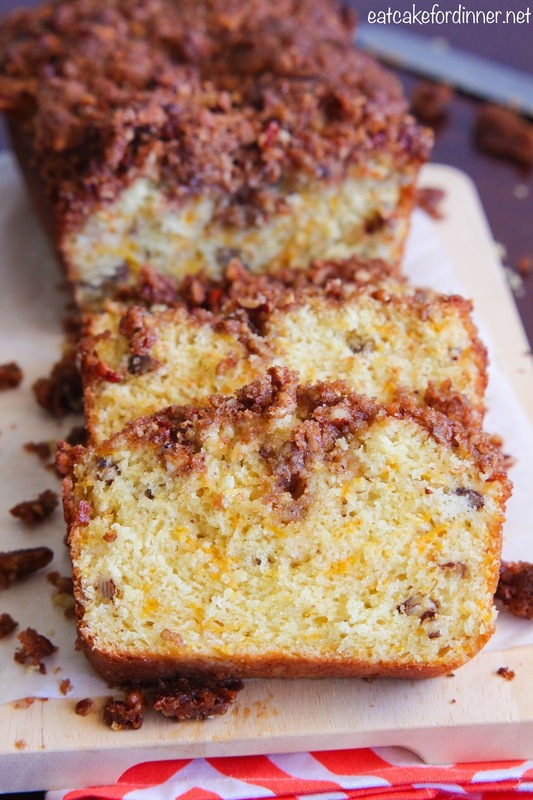 The recipe I decided to feature from this cookbook is this amazing Peach Bread. I was so surprised that it actually tasted like peaches. Sometimes peach can be such a delicate flavor that I thought it would be hidden by all the other flavors in this bread, but it wasn't. The flavor of the peaches mixed with the orange extract and cinnamon topping is amazing. 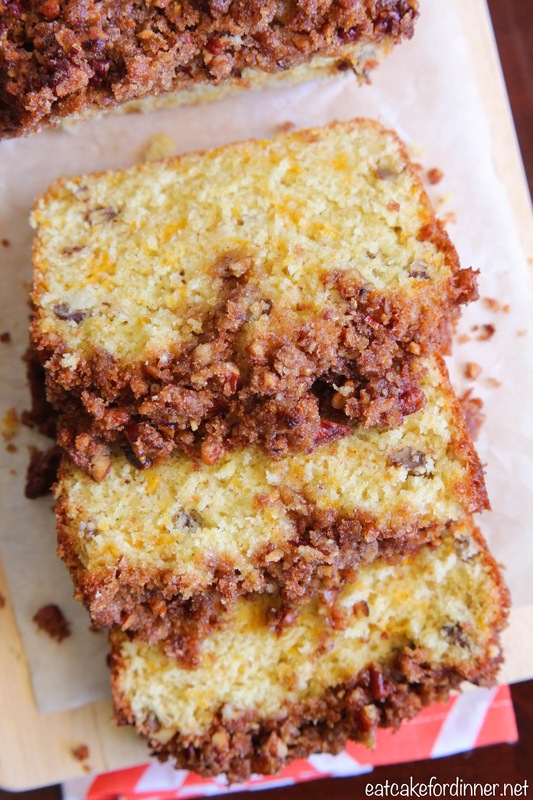 The texture is so soft and the topping is sweet and crunchy. The only thing is, the topping was really messy. About half of it falls off when you try to slice the bread. So, next time I will use half as much and I think it will be perfect. I will definitely be making this bread over and over again. Preheat oven to 350 degrees. Grease a 9x5-inch loaf pan; set aside. In a large bowl, whisk together the flour, baking powder, baking soda and salt; set aside. In a medium bowl, beat together the butter and sugar using an electric mixer until fluffy. Add the eggs, one at a time, beating well after each addition. Beat in the orange extract. Stir in the buttermilk and mashed peaches. Add the flour mixture, mixing just until incorporated. Do not overmix. Using a rubber spatula, fold in the nuts. Pour batter into prepared loaf pan. 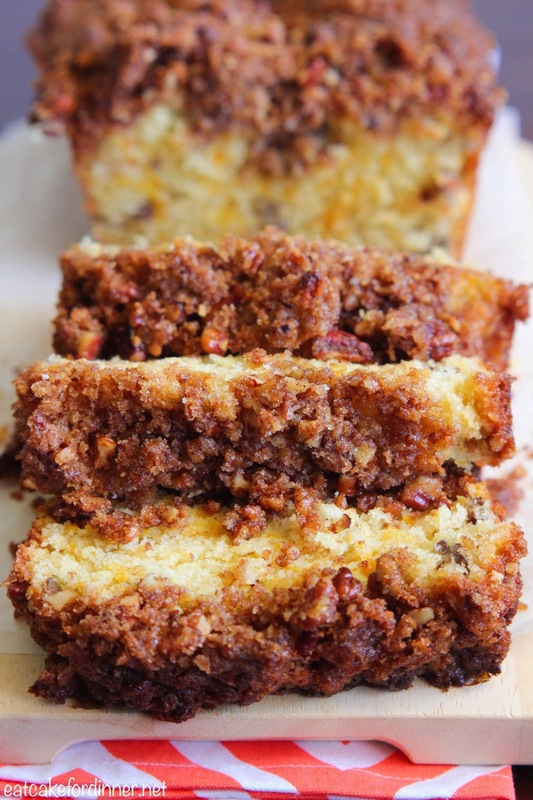 Make the topping: In a bowl, using a fork, combine the butter, pecans, brown sugar and cinnamon to make a crumbly topping. Sprinkle over the batter in the pan. Bake until browned on top and a toothpick inserted in the center comes out clean, 50-60 minutes (I baked mine 52 minutes). Remove from oven and let cool in the pan for 10 minutes, then remove from pan and cool completely. Slice and serve. Jenn's Notes: One 14.5 oz. can of yellow peach slices equals one cup of mashed peaches. I recommend cutting the topping recipe in half from what is listed above. I received this cookbook from Blogging for Books for the purpose of this review, but all opinions expressed herein are my own. I LOVE anything peach. Since it is peach season, would this work with fresh peaches? Hey Liz! If you use really ripe peaches that mash up nicely, then yes, you can use fresh.